We had the opportunity for a quick Q & A with Ryan Merchant and Sebu Simonian of Capital Cities, a new Electro Pop Rock Dance duo out of Los Angeles who will be performing at The Shelter in Detroit on May 15th. Scope out our interview and watch their video below. NOIZE-Will May 15th be your first time performing in Detroit? NOIZE-What can fans expect at one of your shows? CC-A great mix of electronic beats and live instrumentation, synchronized dancing and an inclusive vibe created to destroy inhibitions. NOIZE-Any interesting tour stories so far? CC-We are currently in Mobile, Alabama visiting our sound guy’s parents. Last night they bought 20 pounds of crawfish, laid it out on the kitchen table over old newspaper and we gorged for hours. Most of our good stories involve memorable meals. We love to eat. NOIZE– When did you both realize that music could be your full-time career? CC-When we won our first major ad campaign while working as jingle writers. NOIZE-You have a pretty snazzy video for “Safe and Sound.” Can you give us some insight into the making of it? It looks like it was a lot of fun! CC-The best part about making this video was learning to dance in multiple styles. We worked with a choreographer named Mandy Moore, who is an expert at teaching non-dancers. In only a few lessons, she had us doing a passable Gene Kelly imitation. Unfortunately, during rehearsals Sebu injured his achilles tendon and on the day of the shoot we had to dope him up so that he could dance on his injured foot. He was a trooper. NOIZE-We are familar with Mandy Moore from the show “So You Think You Can Dance.” She is amazing. I heard “Safe and Sound” on Detroit radio last week. Has anything changed for your band now that you’re getting widespread radio play? CC-Yes, a lot more people know about our music now and we are getting opportunities to play all over the place. NOIZE-I read that Sebu went to music school. Where, and what was that like? CC-Sebu went to Cal State Northridge and graduated in 2001 with a BA in music with a focus on music industry studies. He had a great time there, but the music business has changed so much since then that most of what was taught is completely irrelevant today. CC-I love everything about Motown music. The best signers (Stevie Wonder, Donny Hathaway etc…), the best songs (Jackson 5, Stevie Wonder, Smokey Robinson) and the best recordings. They captured an energy and authenticity that you rarely hear today. NOIZE-What do you think of social media as a tool to spread the word about your music? Do you have fun with it? Which are your favorites? CC-Social media is essential for a band trying to make it today. Platforms like Facebook and Twitter allow you to have a direct conversation with your fans which in turn creates a strong bond between them and the band. You can get very creative with how you use social media and learn a great deal from experimentation. Facebook is probably our favorite. NOIZE-You’re about to release your debut album “In a Tidal Wave of Mystery” June 11…What is your state of mind right now? CC-Tired because we are on a grueling tour, but very excited to put out this body of work we are so excited about. NOIZE-What do you have planned for the rest of the year? CC-Touring, Touring, Touring. Make some amazing music videos to accompany the songs on the album. This entry was posted on Saturday, May 4th, 2013 at 1:07 AM. 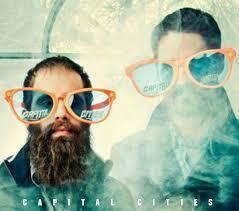 It is filed under Featured Stories, Interviews and tagged with CAPITAL CITIES. You can follow any responses to this entry through the RSS 2.0 feed.